From whale hunting in the nineteenth century, to whale protecting in the twentieth century and whale watching in the twenty first century the Azores islands and surrounding marine habitat have become a whale’s peaceful paradise. To get the flavor of the islands and appreciate these beautiful and peaceful animals, watch this video. To learn about whaling in California by the Portuguese shore whalers from the 1850’s to early 1900’s, the majority of whom came from the Azores islands, please read our publication The Portuguese Shore Whalers of California, 1854-1904. By today’s standards, whaling is a cruel and heartless industry, pitting men and their equipment against these wonderful mammals of the sea. Yet whaling once played an important part in improving people’s standard of living in many areas of the world. 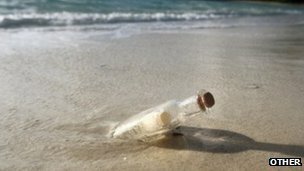 An 11-year-old US boy was stunned to get a reply to his message in a bottle from Portugal’s Azores Islands – via the more surefire medium of email. Curtis Kipple wrote a letter about himself and his hometown in New York state, and put it in a bottle which was dropped into the Atlantic in March. The message was found last week by Ana Ponte, 25, from a fishing village in the island of Terceira, on the Azores archipelago. The fifth-grader’s bottle had travelled 2,600 miles (4,190km). “My brother and my father wake up earlier today and went to sea to catch a seafood very common here, and found a bottle with a message from a boy Curtis Kipple,” said Ms Ponte’s email -written in both English and Portuguese – to Curtis’s school. York state – said the project had really caught the children’s imagination.”Curtis had tears in his eyes when I told him the news,” said Mr Albrecht. The boy’s bottled message was not the first to be found – another was discovered in Nova Scotia in June – but Curtis’s has travelled the farthest.